CRISIS | Network, Information and Computer Security Lab. 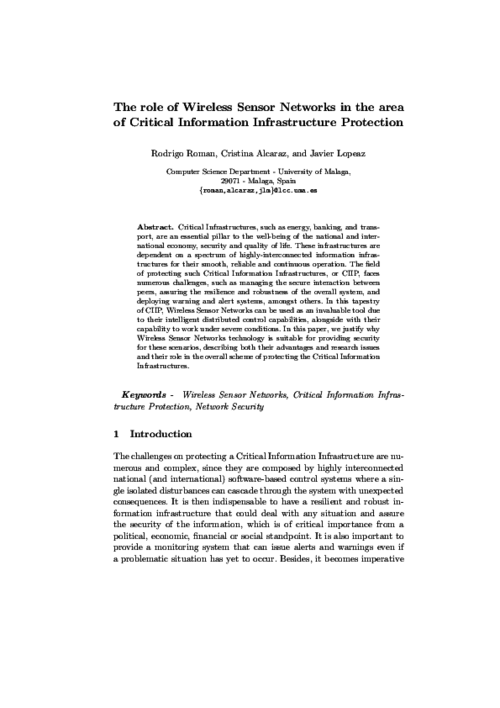 CRISIS is mainly focused on the design of security solutions for Critical Information Infrastructures (CIIs) by means of the development of protection, control and evaluation mechanisms. These solutions use Wireless Sensor Networks (WSNs)  as a main technological platform because that technology facilitates a distributed control and allow the different components of the network to remain operative, even in crisis situations . In order to guarantee the faultless interoperability of the protection, control and evaluation mechanisms, new security services had to be created and integrated into a Service-Oriented Architecture. 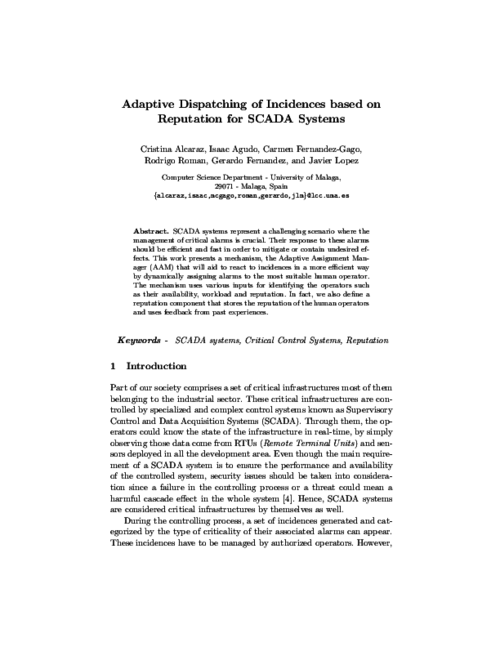 This Architecture was specifically devised for Critical Infrastructures (and in particular for SCADA systems ) using a trust management model, which was also designed for this purpose. Finally, the Architecture was validated and verified in different ways. On one hand, we designed and developed management and maintenance systems embedded into the Architecture, such as Early Warning , Dynamic Reconfiguration and Auditing Systems. On the other hand, with the aim of providing support for the infrastructure, some tools for decision support and risk assessment were also provided . Lastly, an integration analysis of WSNs into the Internet and a security analysis were carried out. The idea were to study the feasibility of using the WSN technology in different critical scenarios, such as First Responders and SCADA systems . 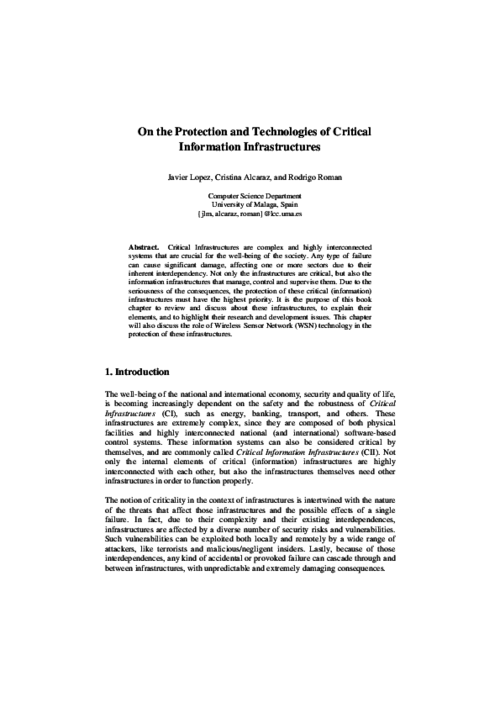 1st International Workshop on Critical Information Infrastructures Security (CRITIS’06), LNCS 4347, Springer Berlin / Heidelberg, pp. 166-178, 2006. DOI More.. It is commonly agreed that Wireless Sensor Networks (WSN) is one of the technologies that better fulfills features like the ones required by Critical (Information) Infrastructures. However, a sensor network is highly vulnerable against any external or internal attacks, thus network designers must know which are the tools that they can use in order to avoid such problems. 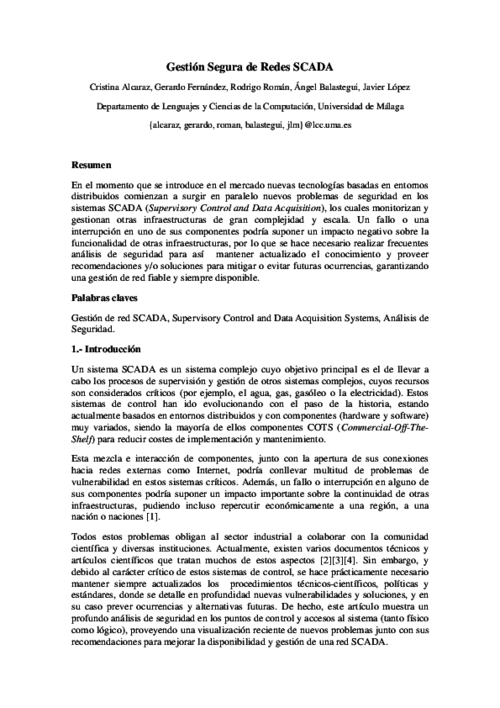 In this paper we describe in detail a procedure (the KMS Guidelines), developed under our CRISIS project, that allows network designers to choose a certain Key Management System, or at least to know which protocol need to improve in order to satisfy the network requirements. 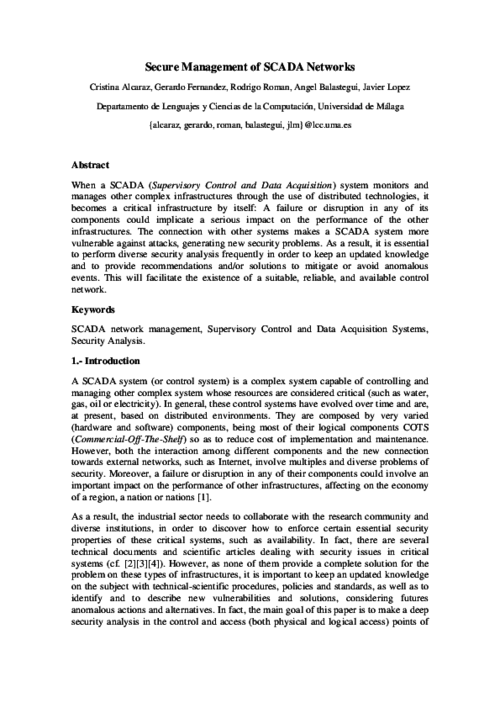 On Foundations of Security Analysis and Design IV, FOSAD 2006/2007, Springer, LNCS 4677, pp. 160-182, 2007. DOI More..
Critical Infrastructures are complex and highly interconnected systems that are crucial for the well-being of the society. Any type of failure can cause significant damage, affecting one or more sectors due to their inherent interdependency. Not only the infrastructures are critical, but also the information infrastructures that manage, control and supervise them. Due to the seriousness of the consequences, the protection of these critical (information) infrastructures must have the highest priority. It is the purpose of this book chapter to review and discuss about these infrastructures, to explain their elements, and to highlight their research and development issues. 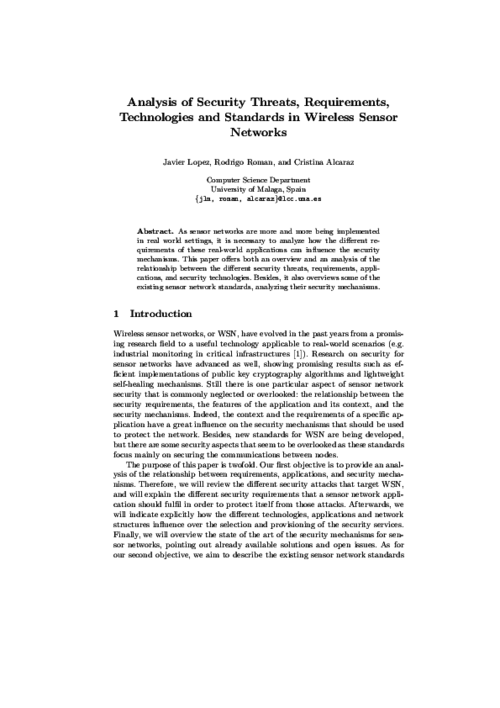 This chapter will also discuss the role of Wireless Sensor Network (WSN) technology in the protection of these infrastructures. Information Security Technical Report, vol. 12, no. 1, Elsevier, pp. 24-31, 2007. DOI More..
Critical Infrastructures, such as energy, banking, and transport, are an essential pillar to the well-being of the national and international economy, security and quality of life. These infrastructures are dependent on a spectrum of highly interconnected information infrastructures for their smooth, reliable and continuous operation. The field of protecting such Critical Information Infrastructures, or CIIP, faces numerous challenges, such as managing the secure interaction between peers, assuring the resilience and robustness of the overall system, and deploying warning and alert systems, amongst others. In this tapestry of CIIP, Wireless Sensor Networks can be used as an invaluable tool due to their intelligent distributed control capabilities, alongside with their capability to work under severe conditions. 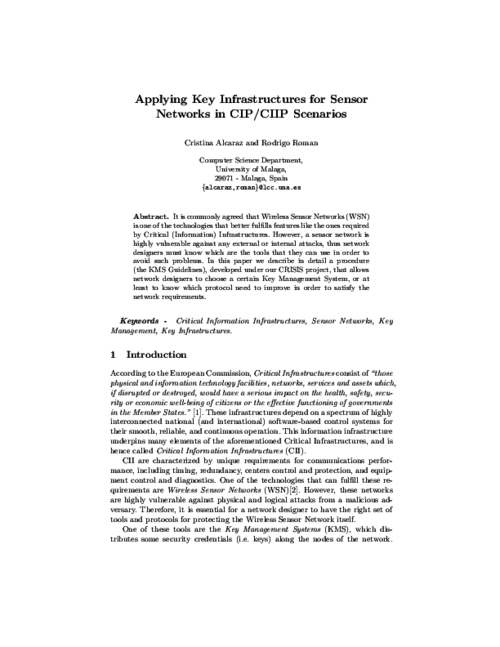 In this paper, we justify why Wireless Sensor Networks technology is suitable for providing security for these scenarios, describing both their advantages and research issues and their role in the overall scheme of protecting the Critical Information Infrastructures. 3rd CompanionAble Workshop - Future Internet of People, Things and Services (IoPTS) eco-Systems, xxxx, pp. xxxx, December, 2009. More..
Wireless sensor networks are considered as an integral part of the Internet of Things paradigm. Not only they provide a virtual presence to elements of the real world, but also allow any computationalsystem to know about the physical state of those elements thanks to the use of embedded sensors. In order to belong to the Internet of Things, the elements of a sensor network can implement Internet protocols and services such as the TCP/IP stack and web services. Still, a question that must be raised at this point of time is whether all sensor network applications should be completely integrated into the Internet or not. 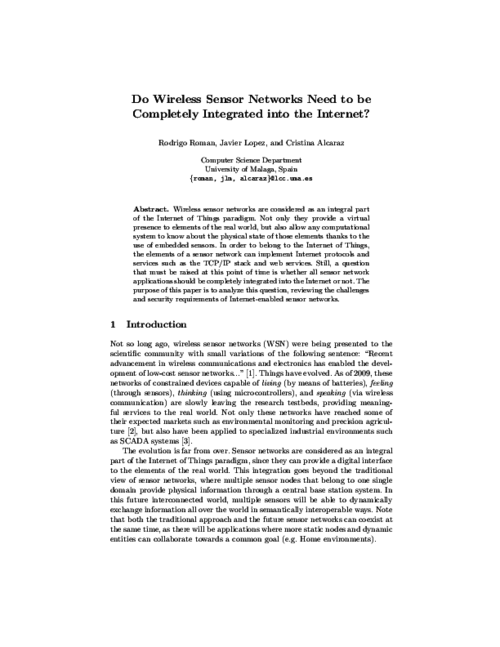 The purpose of this paper is to analyze this question, reviewing the challenges and security requirements of Internet-enabled sensor networks.